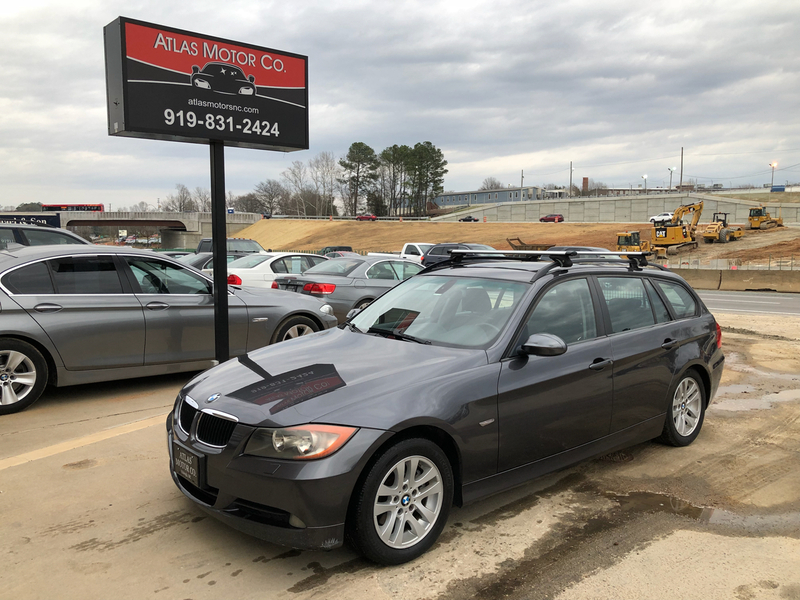 Used 2007 BMW 3-Series Sport Wagon 328xi for Sale in Raleigh NC 27603 Atlas Motor Co.
We are proud to offer this 2007 BMW 328xi Sport Wagon! With over $1500 of recent work done in our shop, this car is ready to roll for its new owner! Stop by before this one is gone! We take great pride in the BMW's that we sell. Every single BMW we sell gets a 300 point inspection as well as full service which includes a fresh oil change performed by our factory trained BMW technician. We spend the money to make sure the cars that leave our lot as the best quality vehicles available. We make sure that no one, including the franchise dealerships, will beat our cars in terms of quality or price. We know these cars inside and out and have a wide selection of BMW's to make sure we have the right one to fit your budget. Financing is available for good or bad credit! Apply online! Come check us out, you won't be disappointed! At Atlas Motor Co we are passionate about providing quality vehicles at fair prices. We go the extra mile to make sure that all of our cars have been checked out, every single vehicle we sell has passed NC state inspection. We also provide a free CARFAX with all of our vehicles! Credit Union and USAA members drive with as little as $0 down with approved credit! Apply on our website to see what you qualify for! All DMV work is handled by us so no need to make trips to wait in line at the DMV! We accept all types of trade ins and warranties are available on most cars as well, call us at 919 831-2424 with any questions! Visit Atlas Motor Co. online at atlasmotorsnc.com to see more pictures of this vehicle or call us at 919-831-2424 today to schedule your test drive. Please verify availability, options and price prior to purchase. Information deemed reliable, but not guaranteed. Interested parties should confirm all data before relying on it to make a purchase decision. All prices and specifications are subject to change without notice. Prices do not include additional fees such as government fees and taxes, title and registration fees, finance charges, dealer document preparation fees, processing fees, and emission testing and compliance charges. Please verify actual mileage as mileage listed may not reflect actual miles due to test drives and demo.